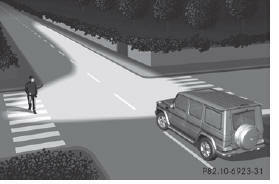 The cornering light function improves the illumination of the road over a wide angle in the direction you are turning, enabling better visibility in tight bends, for example. The cornering light function can only be activated if the low-beam headlamps are switched on and the fog lamps are switched off. : if you are driving at speeds above 25 mph (40 km/h) or switch off the turn signal or turn the steering wheel to the straight-ahead position The cornering light function may remain lit for a short time, but is automatically switched off after no more than three minutes.